Converts any HDTV HDMI connection into DVI-D (digital) or converts any DVI cable into HDMI. This unique adaptor have a DVI connectors that swivel on either left or right providing angled connection. 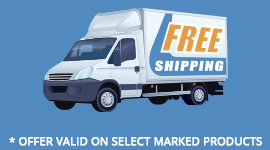 Works with any HDTV with HDCP, set-top boxes, DVD players and switches. It is RoHS Green Certified and production process that uses laser jacket stripping & aluminum foil cutting with precise machine soldering. Swivels left and right 90 degrees (for a net full 180 degree motion). 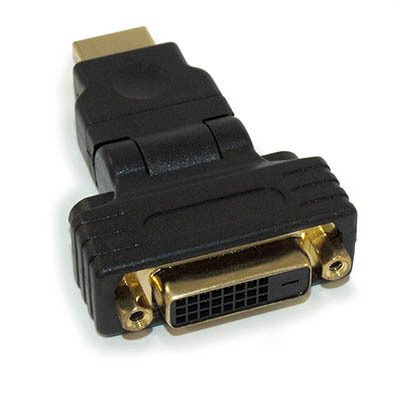 (Connectors: HDMI Male Type A to DVI-D Female). This connector is NOT suitable for DVI-I (analog) type connections. 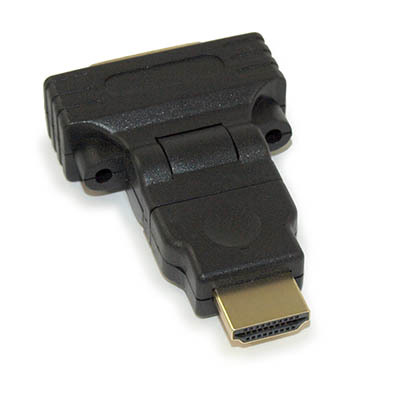 Compatible with HDMI with Ethernet/3D specifications to the v1.4A HDMI Specifications.